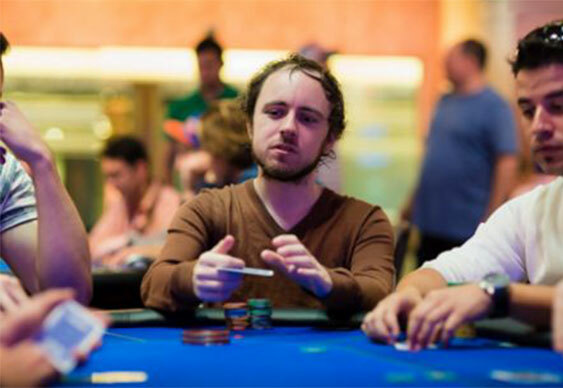 After years as a cash game grinder, British pro Patrick Leonard has taken the online poker world by storm in 2014, adding countless impressive scores to his résumé and earning himself a trio of British Poker Awards nominations. In his first Bluff Europe interview, he goes into detail about Hungary's close-knit online community, the emotional impact of tournament play, and the importance to poker players of keeping a good work-life balance. It has only taken a few days back in the UK to convince Patrick Leonard that his decision to relocate to Hungary was the right one. "Since I've been back it's rained every day, so it makes me happy I'm not living here," the 25-year-old Geordie laughs. He's made the rare trip back to England to play EPT London, and when I catch up with him during the dinner break of a particularly "entertaining" high-roller event, he displays the wry humour that is uniquely British. There may be something in the water in his new home of Budapest, but it hasn't taken away from his affable personality. Leonard is something of an outlier, moving away from the United Kingdom while dozens of foreign pros are flocking to these shores, but he has no regrets. And why would he? Since deciding to focus more on tournament poker in 2014, he has risen to the top of the prestigious PocketFives MTT rankings and earned himself three nominations for the upcoming British Poker Awards. What's his secret? Just good, old-fashioned hard work. "I'm learning quickly because I'm playing more and have more stuff to watch over," he explains. "If I play a tournament session then I have 15 hours of play to look back at whereas if I play a couple of hours of cash games it's less to study." As is the case with many online tournament players, the player known as 'pleno1' places value in looking back over sessions after the fact, as there is only so much you can pay attention to while in the zone. And while he wouldn't say he's come close to solving aspects of cash game poker, he certainly prefers the variety offered by tournament play, both on the felt at the time and analysing his play afterwards. "The main thing with MTTs is that your mind is always working and changing, but with cash games it can get a bit monotonous. You're just in autopilot a lot of the time and often trying to make the same decision, whereas in tournaments you'll run into these awkward situations where one player has a certain stack size and someone else will have a different stack size, and that's before you consider things like ICM. Despite getting a firm grounding in cash game play, which he played to a high standard for "four or five years." Leonard feels his mind is better suited to tournaments as "I always need something to keep me occupied and to keep focused." He draws particular attention to the different phases of tournament play, going from just trying to survive to trying to win, and it is here that his methodical approach shines through. Naturally, some elements of the transition from cash to tournaments have not been quite as straightforward, and Leonard appreciates that the latter can take more of an emotional toll. "Tournament poker has been a lot more emotional than I was prepared for," Leonard admits with a shrug of the shoulders. "I've never really been angry at poker before, but this year there have definitely been times where I've smashed my mouse. "Sometimes it will just get to me but usually it's more an accumulation of things. Especially on a Sunday if you're playing loads of tournaments and again and again and again you bust out, but I've come to accept that's part of the game." It also helps that he has a great group of friends to help him deal with this aspect of the game, which has helped him overcome the emotional challenge which might prove difficult for other players making the same switch. "Poker can be a very lonely game, and if every day you go to bed [after a long session] and you're just angry and haven't talked it over with someone, it can get very frustrating," he says. For this reason, if he or one of his friends has a difficult time of things then they will always have someone to speak to online in order to let out some frustration. Surrounding yourself with fellow poker players can be great when it comes to helping analyse your game, but a lot of the time it can help to develop other interests so you can put that all to one side. For Leonard this is football, where he is an avid Newcastle United fan and a pretty handy number 10 for his local side. In fact he claims to model his game on Teddy Sheringham, one of the bigger British names to combine football and poker from the other side of the divide. "I really like having friends from my football team because it means I can have some time where I'm not thinking about poker," Leonard admits. If you're always with poker players, and especially if you're living with poker players, then poker is always going to be on your mind, but I can switch off before a session by going to train for two hours with my football team - then I'll come back and be hungry for poker again." He is not surprised to see others with a similar work-life balance flourish in recent weeks, not least his friend Fedor 'CrownUpGuy' Holz, who won the WCOOP Main Event for $1.3m. "Being balanced really helps get your mind off things. It's not a coincidence that when Fedor won the Main Event he didn't play a single other WCOOP event - he was on holiday the whole time and came back fresh-minded." Leonard will continue to play online during live tour stops - in fact, during EPT London he eschewed most of the live cash games and played online, before flying back to Hungary in time to win a $215 rebuy tournament for just south of $20,000. However the ability to visit new places and explore different cities away from the table also plays a part for him. Leonard doesn't consider himself part of the "main crew" of British poker pros, but feels he has a good, well rounded group of friends, some from the online world and some who he regularly sees in person out in Budapest. Among those he mentions by name are Australian players Jonathan Karamilikis and Andrew Hinrichsen, both of whom helped pleno1 make the transition from talented cash game grinder to tournament boss, as well as enigmatic Finnish online pro €urop €an. While the trio remain close friends, Leonard also sees the value in spending time with poker players who have differing specialities. Among his group are high stakes Pot Limit Omaha cash game specialists, heads-up sit'n'go talents and everything in between, and he will be the first to admit he learns a lot from watching diverse groups interact with each other. When they go out to restaurants the dinner table almost starts to resemble the poker table - everyone's paying attention, even when the action isn't on them. "It's harder for poker players because you don't want to talk about poker while you're out at dinner, but it naturally comes up because it's on your mind so much," he says. What's important is we don't just talk about tournaments all the time, whereas a lot of the groups of guys in the UK might all be tournament players or all cash game players sticking around together." It's not just the variety of specialisms which Leonard appreciates, however, but also the variety of stakes played by his group of friends, something which has only grown as he has begun to develop a stable of his own, coaching players as well as staking them. "[The players I stake] play lower stakes tournaments and we do hand history reviews together, and I actually probably get a lot more out of that than anything else because we break down hands so much. Because I want them to be as good as possible, obviously we're really going into a lot of detail. "I also get to see what their thought processes are, so if I play a lower stakes tournament I'll know these guys are thinking x, y or z as well. They might not know how high stakes work but I might not know how low stakes works - they learn a little bit and I learn a little bit about them, which I think is underrated. It almost goes without saying, but Leonard, like most players of his calibre, is a huge admirer of the structured coaching and staking model employed by the German pros who seem to dominate every high roller going. However he has been just as impressed by the rise of players from the Iberian peninsula. He makes particular reference to the famous 'Glory House', a group of Spaniards including Adrian Mateos and Sergio Aido who have made London their home, and says it is "no coincidence" that some of the most successful players in the world are living under the same roof and are able to bounce ideas off each other 24/7. Spain is not alone in this respect, with Leonard having plenty of respect for Portuguese pros João 'Naza114' Viera and Rui 'RuiNF' Ferreira. "These guys are really good - they play a lot, they work hard, they don’t spew and tilt, and I think they have a nice group of Portuguese players,"
It's a stark contrast from some of the preconceptions some people might have had about Spanish or Portuguese players in the past. "There was a time when a lot of people would just 3-bet a guy online because he's Spanish, or sit down at a live tournament with a few Spanish kids and think they had a good table because there were no British or German players, but these guys are good as well. The thing is, in the past assumptions like this might have been true, but there are groups of [Spaniards and Portuguese] who are good players and they have big stables as well. When I mention the triple award nomination, Leonard admits it is all a bit new to him. Not that he's complaining too much. "I haven't really known too much about it in previous years, as normally when I've been grinding it's been with something particular in mind - whether that's the PocketFives leaderboard or other things that I know are coming up," he admits. "I'm not really in the 'crew' of English poker - that core group of grinders who are all friends, but this year the nominations seem more varied - pretty much all the awards are really competitive, there aren't really any stand-out winners." Still, just because the games are getting more challenging doesn't mean there is not money to be made, at least in Leonard's mind. An active forum poster, particularly on BlondePoker, PokerStrategy and TwoPlusTwo, he will sometimes look back through old threads from as long ago as 2007 and find that age-old complaint that 'the games are dead'. "In 2007, people were complaining that the games were tougher than in 2006. In 2008 they were saying they were tougher than in 2007, and every year as I've been going up I keep hearing that the games are dead. It's been said for like 6 years and they're still definitely not dead now." As an avid student of the game he is always looking for new ventures within poker, and thinks online mixed games might be next up for him. However one thing's for sure, he's not the sort of player to let the game pass him by. His three British Poker Awards nominations and position atop the PocketFives MTT Leaderboard probably gives you an idea of how good a year Patrick Leonard has had, but to put it into context here are a few of his biggest scores in 2014. But that only tells part of the story. In 2014 alone, Leonard has 19 five-figure cashes as well as that six-figure Sunday Million score. Not bad going for someone who considered himself a cash game specialist before this year!